We love seeing our centres in the news! Recently Guardian Early Learning – Mulgrave was featured in a wonderful article in the Monash Leader. Children will be able to let their imagination run wild at a Mulgrave learning centre. 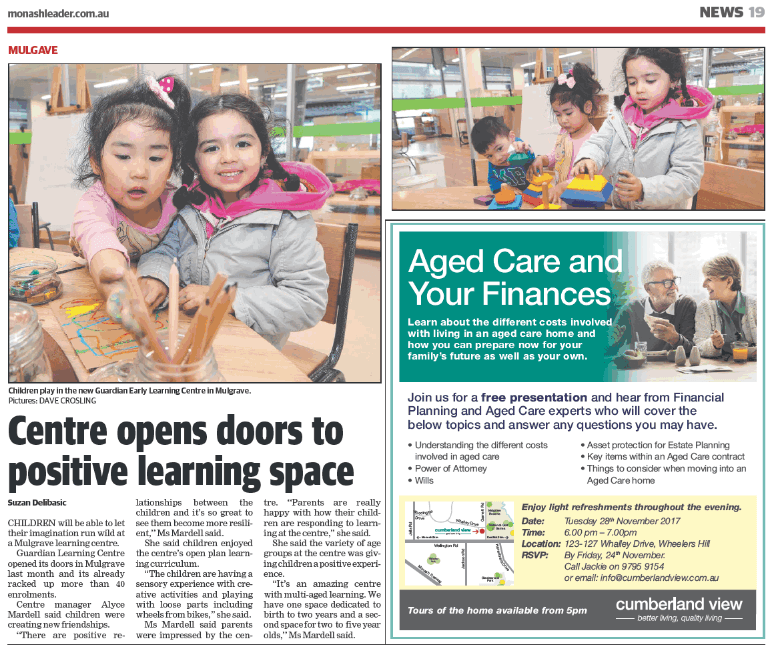 Guardian Learning Centre opened its doors in Mulgrave last month and it’s already racked up more than 40 enrolments. Centre Manager Alyce Mardell said children were creating new friendships. “There are positive relationships between the children and it’s so great to see them become more resilient,” Ms Mardell said. She said children enjoyed the centre’s open plan learning curriculum. “The children are having a sensory experience with creative activities and playing with loose parts including wheels from bikes,” she said. Ms Mardell said parents were impressed by the centre. “Parents are really happy with how their children are responding to learning at the centre,” she said. She said the variety of age groups at the centre was giving children a positive experience. “It’s an amazing centre with multi-aged learning. We have one space dedicated to birth to two years and a second space for two to five year olds,” Ms Mardell said. To learn more about this early learning centre in Melbourne, head here.